The predictive value of polycystic ovaries for PCOS and the development of the related morbidities remains to be better determined. Likewise, methods for distinguishing polycystic ovaries in PCOS from polycystic ovaries in other ovulatory disorders, such as hypothalamic amenorrhea, remain to be established. Finally, it should be remembered that endovaginal U S is an improving technique, becoming more accurate over time. Therefore, the thresholds of the currently used criteria for poly-cystic ovaries are liable to change, and new diagnostic criteria will probably become evident in the near future. The prevalence of PCOS among women with clinically evident menstrual dysfunction can be estimated from four studies evaluating the prevalence of PCOS in the general population (2,3,5,6). These studies noted that the overall prevalence of menstrual dysfunction approximated 20 of the women studied, very similar to the rate of 22.9 reported by 101,073 women participating in the Nurses Health Study II (34). Of the women complaining of menstrual dysfunction, between one-fourth and one-third had androgen excess, notably PCOS (using the National Institutes of Health NIH 1990 criteria). Whereas menstrual irregularity is a common and defining feature of PCOS and other androgen excess conditions in women, the understanding of the pathophysiology of these conditions will help to create newer treatment modalities that address not only the patients' concerns for immediate care, but also the long-term risks associated with it, for which the physician is ultimately responsible. With PCOS now encompassing a wide variety of heterogeneous presentations, work needs to be done to identify which subsets are at greatest risk of endometrial neoplasia, and hence requiring prophylactic measures to prevent associated morbidity and mortality. Exogenous pulsatile GnRH has been used in an attempt to simulate the physiological pattern of pulsatile gonadotropin secretion, with the expected outcome of monofollicular development. It was suggested that this approach was more physiological, potentially avoiding the risks of OHSS and multiple gestation. However, the results in women with PCOS have not been promising (94,95). 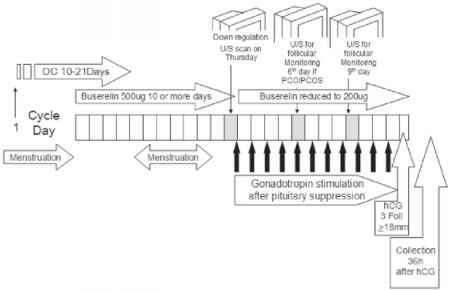 Exogenous GnRH stimulation often caused brisk gonadotropin secretion that resulted in the maturation of more than a single dominant follicle with a high risk of multiple pregnancy. Even after pre-treatment with a GnRH agonist, the rates of ovulation and pregnancy were low and miscarriage rates were as high as 45 (95). 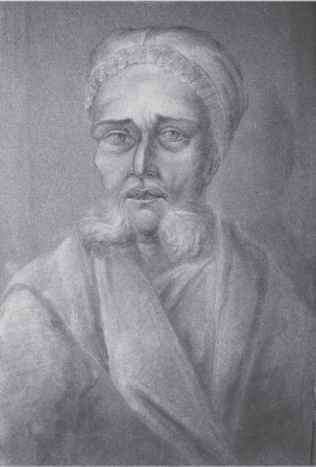 Thus, pulsatile GnRH therapy is rarely used today for ovulation induction in women with PCOS (96). Wedge resection of the ovaries was initially described by Stein and Leventhal (1) at the time that polycystic ovaries were diagnosed during a laparotomy. 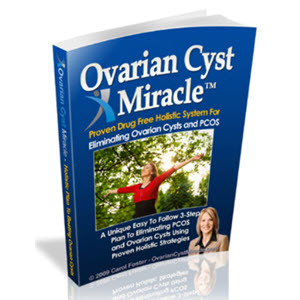 It was found that ovarian biopsies taken to make the diagnosis led to subsequent ovulation. 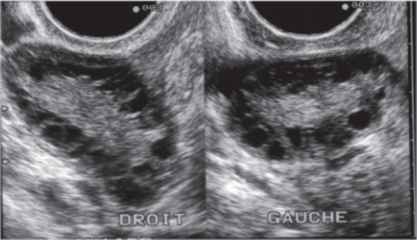 The rationale was to normalize ovarian size and hence the endocrinopathy by removing between 50 and 75 of each ovary. 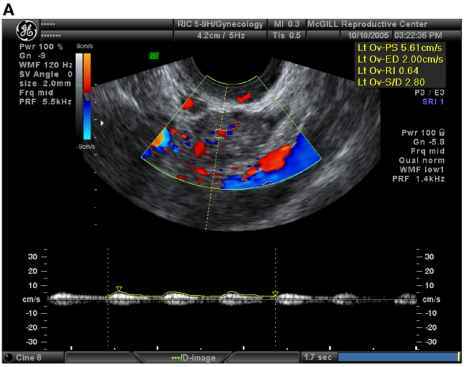 A large review of 187 reports summarized data on 1079 ovarian wedge resections, with overall rates of ovulation of 80 and pregnancy of 62.5 (range 13.5-89.5 ) (2). Another 30 or so years later, Donesky and Adashi (3) were able to increase the summarized experience in the literature to 1766 treatments, with an average pregnancy rate of 58.8 . Because of the realization that significant postoperative adhesion formation occurred and that initial favorable reports of pregnancy rates were not sustained, wedge resection became less popular in the 1970s the same time medical therapies for ovulation induction appeared more successful. Marynick SP, Chakmakjian ZH, McCaffree DL, Herndon JH. Androgen excess in cystic acne. N Engl J Med 1983 308 981-986. 45. Vexiau P, Husson C, Chivot M. Androgen excess in women with acne alone compared to women with acne and or hirsuitism. J Invest Derm 1990 94 279-283. 47. Nader S, Rodriguez-Rigau LJ, Smith KD, Sternberger E. Acne and hyperandrogenism. Impact of lowering androgen levels with glucocorticoid treatment. J Am Acad Derm 1984 11 256-259. Described in patients of various ethnic origins, significant clusters of patients seem to be localized to some regions in Brazil and Lebanon. Affected patients have near-complete absence of subcutaneous AT from birth, leading to marked prominence of muscles and veins. During childhood, they are noted to have a voracious appetite, accelerated growth, and advanced bone age. Umbilical hernia or prominence of the periumbilical skin, and an acromegaloid appearance because of enlargement of hands, feet, and mandible, are other common features. Hepatomegaly from fatty infiltration may be seen at birth or later in life and may be accompanied by splenomegaly. Acanthosis nigricans is often observed over the neck, axilla, groin, and trunk. Postpubertal girls develop clitromegaly and features of polycystic ovarian syndrome. Less commonly, some patients develop multiple focal lytic lesions in the appendicular skeleton, hypertrophic cardiomyopathy, and mild mental retardation (12-15). The probable mechanism for the increase in risk of endometrial cancer associated with obesity in postmenopausal women is the obesity-related increase in circulating estrogens (38). In premenopausal women, endometrial cancer risk is also increased among women with polycystic ovary syndrome, which is characterized by chronic hyperinsulinemia and progesterone deficiency (39). Thus, in both pre- and postmenopausal women, endo-metrial cancer is increased by the mitogenic effects of estrogens on the endometrium when these effects are not counterbalanced by sufficient levels of progesterone. Many studies have shown large increases in endometrial cancer risk among postmenopausal women who take unopposed estrogen replacement therapy (i.e., estrogen in the absence of progesterone) (40), as well as increases in risk among women with higher circulating levels of total and bioavailable estrogens (18). To be honest there is no free download for The Natural Pcos Diet. You have to pay for it, just as you have to pay for a car, or for a pair of shoes, or to have your house painted.